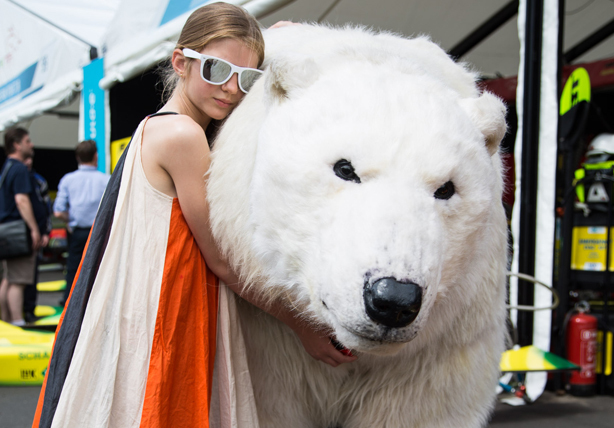 Greenpeace has produced a new campaign film that celebrates electronic motor sport Formula E.
The short film was made at the Formula E championship finals in Battersea Park, London, and features the famous animatronics Greenpeace polar bear, Paula. In a reverse of the confrontational style often employed by Greenpeace to get its message across, the environmental campaign group has given the green light to the new motorsport. The film, which will be launched later today, features Paula being taken for a day at the races by a girl and becoming a fan of the sport. It ends with the message: "The oil age is coming to an end. Don’t get left behind." It was produced by film-maker Prano Bailey-Bond and is intended to be shared on social media channels. Greenpeace climate campaigner Barbara Stoll said the Formula E championship showcased the innovation in electric vehicles and would only get more exciting as the cars continued to improve. She added: "It was a great demonstration that there are always alternatives to fossil fuels, and no technological barriers to a cleaner future. And that’s the point we’re trying to make with this film – not that climate change can be solved with single-seater racing cars, but that clean, low-carbon technologies are ready to replace the dirty fossil fuels we’ve been relying on, and what seemed futuristic a decade ago is now reality." A Formula E spokesman told PRWeek: "We are pleased that Greenpeace wanted to work with Formula E to promote the values that we both share. We are on the same side." The new film is in stark contrast to its previous encounters with Formula E’s petrol-head sibling, Formula 1, in a brand attack on Shell. Paula the bear has featured in previous campaigns criticising Arctic drilling. From athletics and cycling to football: Does more money in sport mean more problems?